The TCC alumnus was the keynote speaker at the college’s 62nd Commencement Exercises, held May 14 at the Ted Constant Convocation Center. He earned an Associate of Applied Science in Electrical/Electronics Technology and a Certificate in Electrical/Electronics in 1984 before transferring to Old Dominion University for his bachelor’s in engineering. He noted he is proud of his community college roots and displays a TCC pennant in his Richmond office. Cosgrove served on the Chesapeake City Council, was vice mayor of Chesapeake and was elected to the Virginia Senate in 2013. President Edna V. Baehre-Kolovani thanked Cosgrove for his continued support of TCC and reminded the graduates of a special accolade the college recently received. “In case you missed it, you are graduating from the number one community college in Virginia,” she said, as appreciative applause erupted. TCC received that distinction from the higher education website Schools.com, which acknowledged the college’s high number of transfer students, commitment to military-related students and support of families through onsite child care. 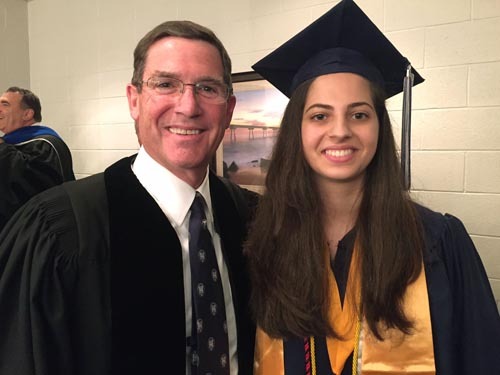 Student speaker Nadine Naser, who received her Associate of Science in Engineering, credited TCC for providing the support she needed to succeed academically and personally. Naser filled that void by taking an active role in Phi Theta Kappa, Student Government Association and the service club TCC-CARES. Naser is a Chesapeake resident and Great Bridge High School graduate. More than 1,900 students received certificates or associate degrees in spring 2016, becoming the newest TCC Alumni members.